From family fun excursions to a couples night out, there are countless things to do in South Florida. If you follow these tips to a great vacation, you will be sure to bring home memories of experiences you can’t catch anywhere else on these family and couple related activities. Read below to find out the best South Florida tours and activities in town! If you are looking for family related activities or activities for couples, Segway tours starting on the 2.5 mile Hollywood Boardwalk is the perfect fit. This South Florida tour has the best rates in all of Broward County and is rated #3 on Tripadvisor.com for unique tours and activities in Hollywood, FL. On the one hour Segway tour, it covers five miles in total, while riders wear headsets and listen to funny impersonations of famous characters such as Mr. President, Peter Griffin, and Optimus Prime. You will not only get to have fun riding this amazing machine, but you will also learn about all of the international restaurants as you enjoy the breathtaking beach scenery. After your Segway tour, riders receive complimentary pizza, ice cream, and great discounts to some of the best restaurants right on the beach! Segway tours and excursions are available by reservation seven days a week, from 7 am – 11 pm and located in the Hollywood Beach Resort at 101 North Ocean Drive, Hollywood, FL, 33019. To reach them by phone, call (954) 903-7049. Segways are one of the best outdoor activities in South Florida because they are easy to use and all ages can participate. Not to mention, they are a very earth friendly way to see the sights instead of driving your car. You’ll get a chance to ride full speed (12.5 mph), learn how to ski in the sun, and even try some cool tricks! You can document your fun day riding around on a Segway while your tour guide takes pictures and videos, and sends them to you at no cost! 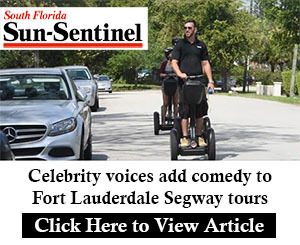 On top of their Segway tours in Hollywood Beach, this great tour company also books tours in South Florida on airboats, helicopters, jet-skis, kayaks, jetlev rides, guided paddleboards eco-tours and fishing charters. Book an airboat tour and venture into the Florida Everglades where you’ll encounter all different types of creatures, from wood storks to manatees to alligators. Jet lev rides are a new and innovative water sport where you wear a state of the art jet pack and fly over the water. This state of the art system propels you with a water jet system. For a more traditional outdoor adventure, the helicopter rides, kayaks or jet-skis are great activities for couples. Helicopter tours visit key destinations in Hollywood, Fort Lauderdale, Miami Beach, Boca Raton, Coral Gables and Key Biscayne. For family related activities try paddleboards, air boats or the fishing charter boats. These fun activities will make your day in South Florida complete! If you want to relax and unwind, there are lots of things to do in Fort Lauderdale and Hollywood. Check out Fort Lauderdale by The Sea for great restaurants, bars and shops. Cool down with an ice cream cone or stroll the boardwalk by the water under the stars. There are a lot of nighttime activities in South Florida on Las Olas Boulevard, a long strip of excellent restaurants and great shopping. You can also check out the Riverwalk Arts and Entertainment District in downtown Fort Lauderdale. Riverwalk offers a wide variety of concerts, art galleries, shopping and fine dining. You can’t go wrong with any of these activities, so live your dream and have the time of your life!